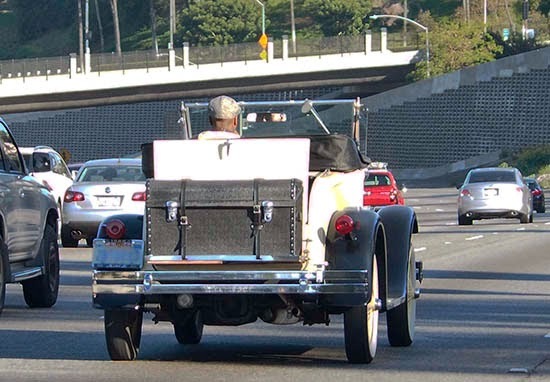 Was following this on the freeway the other day. The freeway! Have no idea what it is. Any thoughts??? Its Barry going to a storage auction. It appears to be a Ford Model A replica made by Shay Motors in 1980. These were fiberglass bodied cars using Ford Pinto drivetrains. Note the HUGE tail lights - a sure tipoff it wasn't actually made in the 1920s or 1930s. Also, with the Pinto engine/trans./brakes one would be able to drive at today's highway speeds. You wouldn't want to try that with most cars from the '30s. The car is likely a Ford Model A replica made in 1980 by Shay Motors. The huge tail lights are the tipoff - much too large for a car from the 1920s or '30s. The Shay used a Ford Pinto drivetrain, so the engine, transmission and brakes are (relatively) modern, making it possible to drive at freeway speeds - something most Model A owners wouldn't want to attempt.